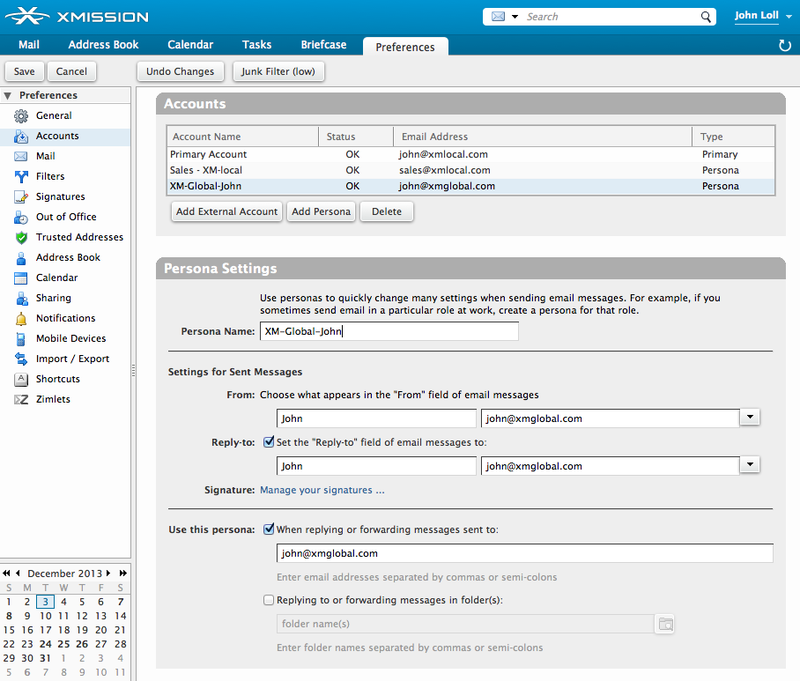 Using a Persona allows you to send messages from a different account while inside your primary Zimbra webmail account. If you have multiple accounts or domains aliased to your primary mail account using a Persona allows you to save money by not having to purchase additional accounts. To quickly setup a new Persona simply click on the Preferences tab inside your Zimbra webmail account. In the left column select Accounts and then click on Add Persona. Now configure the Persona Settings. (Click screenshot to see larger image in a new tab.) Here we give it a name, commonly related to the domain or account. In this customer example it could be “Jane’s Crafty Email”. Next you establish Settings for Sent Messages and establish what the recipient will see as the “From:” and “Reply-to:” address. The first field is for the name associated with the account, such as “Jane,” and then the second field is the email address. Next, specify when to Use this persona:. In most cases you will set the primary address for this personal such as jane@craftydomain.com. Lastly, be sure to Save your changes before exiting the Preferences tab. Click to see larger compose example. Using a Persona couldn’t be easier. Fire up a new email and simply use the drop down menu next to the “From:” field. Select the account (Persona) you want to send from and away you go. If you are responding to an email sent to the specific address the Persona will already be applied by default. You can easily manage signatures for a Persona or Account inside your XMission Zimbra Webmail interface. Domain aliasing is free with XMission and your Zimbra hosting. It is easy to add domains and Zimbra service through the XMission store. For those not using the webmail interface, many common email applications such as Outlook, Thunderbird, and Mac Mail also have support for Persona use although they commonly utilize different names such as personalities, accounts, profiles, and etc. Reference the Help menu inside those email applications to learn more about this feature. Try this out and see how you like it. Share your experience in the comments below. Have any other questions or use tips you would like to have me write about? Please leave those in the comments below as well. PS. Remember to follow, like, circle, and otherwise fawn over us on the social links below.